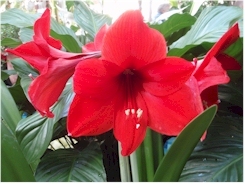 This Amaryllis looks especially striking against a backdrop of leafy green foliage that accentuate the brilliant red color. The Peace Lilly, or Spathiphyllum, would be a suitable choice for this. Please lillies are inexpensive and produce lush foliage. This kind of display works best against a wall, where the Amaryllis blooms can be appreciated from at least three sides. As the flowers tend to fade in turn, you can rotate the plant so that the least attractive, or fading, bloom is nestled in the green foliage. This will result in a attractive display over several weeks. Amaryllis Red Lion is truly a classic. 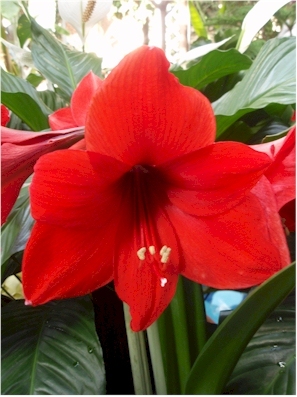 It is probably the most popular Amaryllis for Christmas. One look at the pictures will tell you why—the huge luscious bloomers are a fire-engine stopping red! Four, even five, blooms are born on strong scapes(flowering stems). This is an especially vigorous hybrids that will produce up to three scapes on mature bulbs.